This It's My Birthday rhinestone iron on transfer would make any girl or woman very happy on their special day. It's My Birthday design is versatile enough to please a birthday girl of any age! Let everyone know who is a princess for the day with this great bling on your shirt, your sash, or maybe even your tiara!. These high quality Korean crystal rhinestones sparkle brilliantly. This transfer design is ready to apply to your t-shirt or tote bag using only a household iron. Instructions are included. The hot fix glue that is already applied to the back of each stone is permanent when applied and is activated by heat. A garment blinged with this rhinestone design can be machine washed on gentle and laid flat to dry. This product is not intended for children. The glass crystals may contain lead. 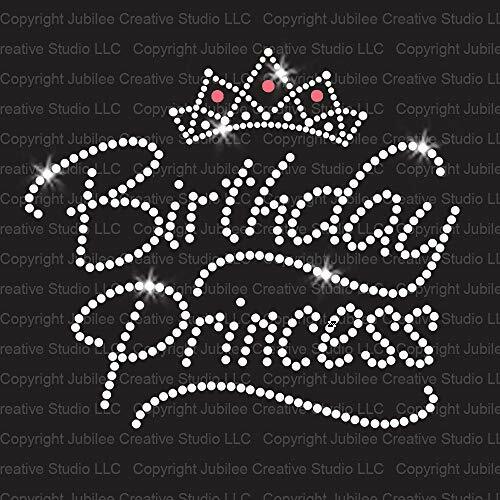 This Birthday Princess rhinestone iron on transfer would make any girl or woman very happy on their special day. This Birthday Princess design is versatile enough to please a princess of any age! Let everyone know who is a princess for the day with this great bling on your shirt, your sash, or maybe even your tiara! These high quality Korean crystal rhinestones and pink metallic rhinestuds sparkle brilliantly. This transfer design is ready to apply to your t-shirt or tote bag using only a household iron. Instructions are included. The hot fix glue that is already applied to the back of each stone is permanent when applied and is activated by heat. A garment blinged with this rhinestone design can be machine washed on gentle and laid flat to dry. This product is not intended for children. The glass crystals may contain lead. 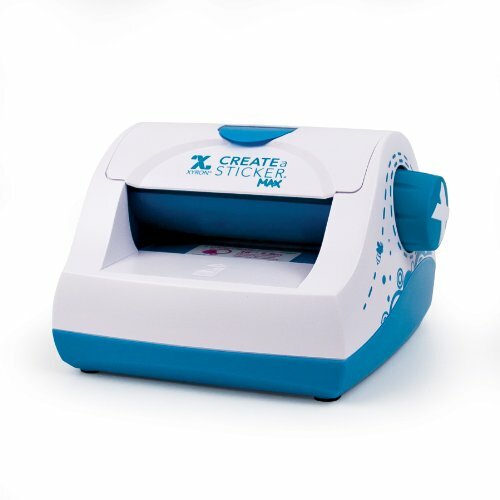 This Birthday Squad rhinestone iron on transfer would make any girl or woman very happy on their special day. 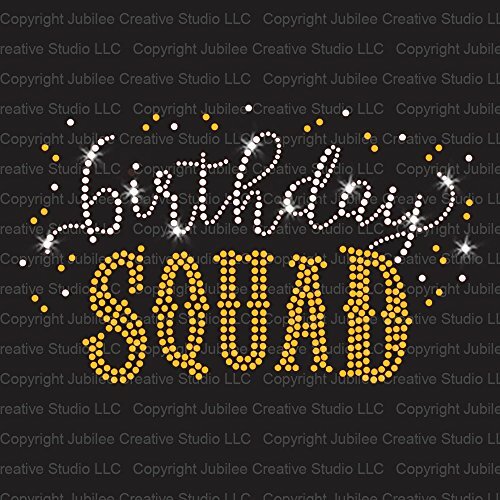 Birthday Squad design is versatile enough to please a birthday girl of any age! 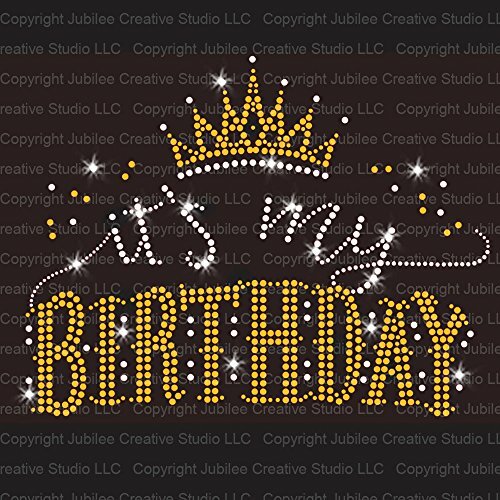 Let everyone know who is a birthday girl for the day with this great bling on your shirt, your sash, or maybe even your tiara! Let everyone know who is a princess for the day with this great bling on your shirt, your sash, or maybe even your tiara!. These high quality Korean crystal rhinestones sparkle brilliantly. This transfer design is ready to apply to your t-shirt or tote bag using only a household iron. Instructions are included. The hot fix glue that is already applied to the back of each stone is permanent when applied and is activated by heat. A garment blinged with this rhinestone design can be machine washed on gentle and laid flat to dry. This product is not intended for children. The glass crystals may contain lead. Peel Off Starform Test Stickers: Large Happy Birthday. A great way to customize your craft and art projects! 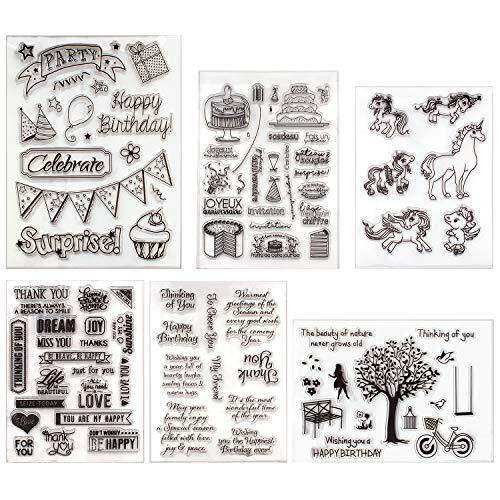 Use Peel Off Stickers on greeting cards, scrapbooking, stationary, candles, glass work and more! This package includes (1) 9x4" sheet of stickers. Available in a variety of colors: each sold separately. Acid and lignin-free. Elizabeth Craft Designs-Large Peel Off Stickers. These stickers are a great way to customize your craft and art projects. This package contains one 4x9 inch sheet of peel-off stickers. Design: Happy Birthday. Available in a variety of colors (each sold separately). Acid and lignin free. Imported. Sticko birthday party classic flat sticker sheet measuring 4 x 7 inches. Sticko stickers are known for their unique styling and broad range of designs in a variety of materials, sizes, colors, and shapes. These bright colored party stickers are perfect for embellishing invitations, cards, scrapbook layouts, and more! 1 sheet per package. Upgrade any birthday party with our Foil "Happy Birthday" Letter Balloon Banner Kit. This golden letter balloon kit comes with 13 foil balloons that spell out "Happy Birthday" and 1 ribbon to decorate your party with. Putting it together is easy! First inflate each 14-inch balloon with air (helium not recommended) then slide the ribbon through the attached tabs on each balloon. 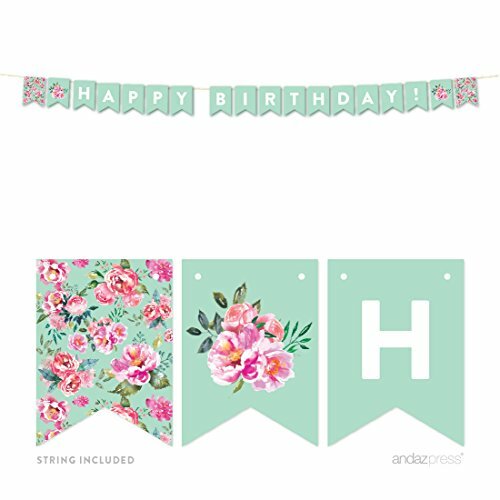 Once your balloon party banner is ready, hang it on your wall for instant style! For more fantastic ways to celebrate, make sure to shop the rest of our affordable birthday party supplies. Foil Letters Balloons for Birthday Party Decoration, the material is excellent aluminum foil balloons and has the function of automatic sealing. Gold / Silver birthday balloons, very shiny!16 inches of birthday foil balloon, includes 13 independent alphabet letters, can be freely taped to the wall. Please inflate the gas slowly until 90% filled and keep away from fire, because of the thermal expansion.Specially designed for babies, kids, adults and even older people, this lovely "HAPPY BIRTHDAY" letter balloons suitable for all birthday party decoration, golden sparkling will bring good luck.Specification:Color: Gold / SilverSize: Height 16 inchesMaterial: Aluminum Foil BalloonsPackage Includes:13pcs Letters Balloons Only (HAPPY BIRTHDAY)Notes:Please refer to the measurement. Tiny measuring error is allowable in normal range. There might be a little color difference due to the monitor, camera or other factors. String your party into overdrive with helium free balloon banners! The fun don't stop til' these pop! Set of 13 balloons. Air inflate. 14" letter balloon. Includes string. Brighten up your bash with these Glitzy Rainbow Happy Birthday Confetti Balloons. Featuring colorful confetti and gold text, these balloons make a lovely addition to a rainbow birthday party. Pair our biodegradable balloons with more rainbow party supplies to totally transform the room. Before inflating, divide confetti evenly among all six latex balloons using the included plastic funnel. Time to blow balloons up! Use a helium tank or handheld air pump. To reduce the risk of choking, do not inflate confetti balloons by mouth. Tie finished confetti balloons to tables and chairs, or tape air-filled balloons around the room. You'll think of countless ways to decorate with confetti balloons and our other matching Glitzy Rainbow Happy Birthday party supplies. 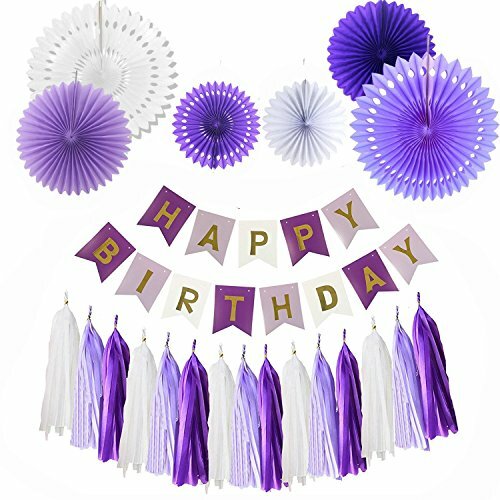 Say "Happy Birthday" with style when you fill up these colorful Happy Birthday Confetti Balloons on someone's special day. Celebrating a kid or adult birthday couldn't look better when you use our birthday party supplies. Add a little tissue paper confetti to each of the six latex balloons with the funnel that's included before you fill them up with air or helium. Create some static by rubbing these balloons on a surface to help the confetti stick to the sides easier. Find more fun ways to celebrate a birthday when you shop our other birthday party supplies. Get your guests in the celebrating spirit with our Latex Fun Happy 30th Birthday Balloons! 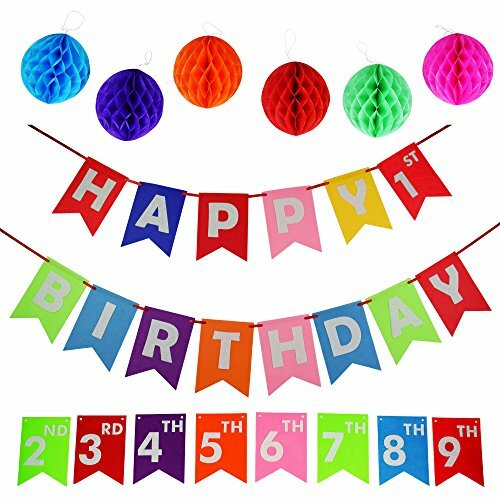 These colorful 12-inch party balloons are printed on one side with a confetti pattern and a big birthday message meant for any 30th birthday party. Fill each latex balloon in this 8-pack with air or helium, then start to decorate! These helium-quality balloons can be tied to furniture, made into a balloon bouquet, or taped to the wall to make an awesome DIY birthday backdrop. Shop the rest of our affordable birthday party supplies for more great ways to decorate! 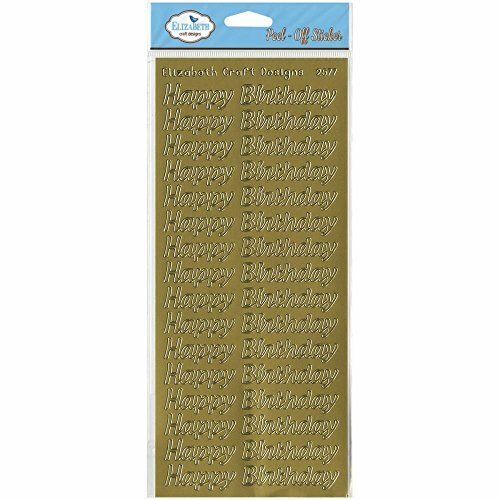 The Elixir Party Birthday Alphabet Letter Party Foil BalloonsThis lovely "HAPPY BIRTHDAY'' 13 alphabet letters of foil balloons set can be freely taped to the wall and independently combined, a great birthday party decoration for the babies, kids and adults! Suit for All AgesNo party is perfect without balloons. This balloon kit is a good choice for kids girls boys adults' birthday decoration. These gold shiny balloons are eye catching, and memorable.Easy to InflateEach balloon has a self-sealing valve.Just need to blow the balloons up with given straws and even drinking straws can do.Three given straws are free.Reusable and No Nasty SmellThese balloons are made of high quality aluminum foil and through stick quality inspection.Every letter is perfect and without any nasty smell.Just deflate and you can use again.Suit for Most Occasion Suit for indoor party , outdoor party.You can use this banner as a wall decoration or as a masquerade item.You can hang these balloons or tape them to the wall.How to Hang Just use strings to through the holes .Each balloon has string holes.Separate or together is OK.NoticeAir-filled only. No helium required.Balloons filled with air do not float Keep away from fire. Help make their birthday a big one with our Latex Fun Happy Birthday Balloons. Printed confetti-style sprinkles and a big "Happy Birthday" message make these colorful balloons a must-have for any adult or kid's birthday party. These latex party balloons come 8 per pack and measure 12 inches when filled with air or helium. Tie helium-quality balloons to furniture, balloon weights, or even your mailbox to show guests where to go! Keep the fun coming by shopping the rest of our affordable birthday party supplies. This is authentic licensed Elmo Sesame Street balloon bouquet. There are 5 balloons in a pack. String and balloon weight are not included.5 BALLOONS IN A PACK :* 1 Supershape Jumbo foil balloon* 2 Star shape foil balloons 18". * 2 Round shape foil balloons 18".Balloons will arrive uninflated. You need helium to inflate the balloons.WARNING: CHOKING HAZARD - Children under 9 years old can choke or suffocate on uninflated or broken balloons. Adult supervision is required. Keep uninflated balloons from children. Discard broken balloons at once.